Eureka, today another post about a rather old recipe of mine. The recipe below is for the second share of the #35 Rusalka Imperial Stout. I originally did a full batch of the #35 Rusalka Imperial Stout and decided to use 10 L of the wort for another Imperial Stout. The difference between the two shares is basically the original gravity and the yeast strain used. I used a dry yeast (Safbrew S33) for this share and increased the OG by adding some sugar and added some raisins and vanilla beans to the secondary fermenter as well. Simple as that. Lets go through the recipe. 05/28/11: Brew day. As already mentioned, this batch is a share of the #35 Rusalka Imperial Stout wort. For further information about the brew day go to #35 Rusalka Imperial Stout. I filled a small fermenter with 10 L of cool wort (OG 18°P), shook the fermenter very well and added a package of Safbrew S33. I then added the dark candy sugar approximately three days later. 06/03/2011: Seven days after pitching. I racked the beer to a secondary fermenter and added another 0.5 kg of sugar plus some two vanilla beans and some raisins. I dissolved the sugar in some water first and boiled the sugar solution for a couple of minutes and added the raisins and two split vanilla beans to the solution as it cooled down. Then added the solution to the secondary fermenter as it reached ambient temperature. I racked the beer after seven days already to get rid of the majority of the yeast and trub. There are still enough yeast cells in the beer to ferment the second share of sugar in the secondary fermenter. 06/13/2011: It is bottling time. Already seven days after racking to the secondary fermenter. The beer was very clear already and I bottled the beer with an addition of sugar to reach a carbonation level of approximately 2 vol of carbon dioxide. I would not recommend bottling such a heavy beer so shortly after racking to a secondary. However, I planned a very long maturation period for this brew. I guess the long maturation process gives the yeast in the bottles enough time to clean up any fermentation byproducts and for the flavors to mellow out. I am writing this post in October 2012 and I haven’t done a proper tasting of this brew yet. I can’t even remember when I last tried this beer anyway. Sure I tried it before but it was still very edgy. I might do a tasting at Christmas this year… Stay tuned! Eureka, its time for another very cool project of mine. I have to apologize for the very few postings lately. I am very busy with my lab research lately. However, I am still homebrewing, drinking beers and yeast ranching. So no worries. I visited my local last week after several months once again and had the opportunity to try a lot of great beers from other homebrewers and even some really amazing commercial examples. They even had Girardin’s Oude Lambik on tab. Wow! Even a Girardin Lambic tastes great. However, a Lambic is not as complex as you would expect from a Geuze because Geuzes are blends of different Lambics to improve the complexity. And this Lambic was no exception. The Oude Lambik has a very subtle sourness and even a malty aftertaste. By the way, the Oude Lambik was flat as expected. 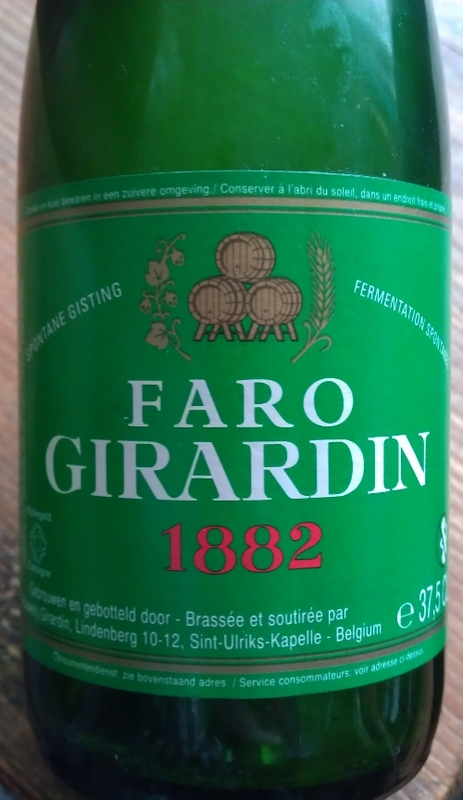 I then tried Girardin’s Faro. A Faro is basically a blend of Lambics and then bottled with sugar and sometimes spices or other sources of sugar such as molasses, caramel are added in addition. In the Faro from Girardin caramel is added. I really liked the Faro because it has some carbonation which makes it easier to appreciate in my opinion.The taste and aroma reminded my of a very young Lambic. Once again, the complexity, sourness and funkiness were rather subtle. It even had a bitter aftertaste. I then tried Girardin’s Framboise before heading home. I assume this Framboise was bottled just a few weeks before. The aroma was just incredible. I have never encountered such an intense raspberry aroma in a beer before. It smelled like a homemade raspberry jam. Amazing! And no sourness or funkiness at all. Just amazing! On the other hand, this particular Framboise was not sweet like other even pasteurized examples. The last Framboise beers I had (like 3 Fonteinen’s) were rather “old” and the fruity character was no longer detectable or lets say rather subtle. Sourness and funkiness were the main components there. However, I would prefer a Gueuze in this case instead. It is somewhat not worthy in my opinion to store a Framboise, Kriek etc. to lose the fruity character. Enough with commercial examples. The whole sour beer stuff reminded me of my latest Lambic attempt. 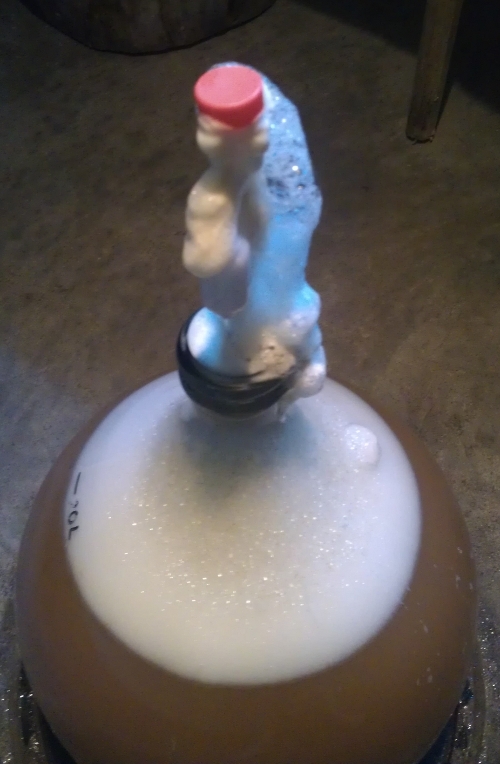 This post is all about my second attempt to brew a Lambic style beer. However not a traditional Lambic beer with the spontaneous fermentation method. I would like to give you a short overview about the whole turbid mash schedule first. Have a quick look at the schedule below. The whole process sounds really difficult but it is not. You basically need three different kettles and that’s it. To get you an idea what a turbid mash schedule looks like have a look at this Youtube video. 06/28/12: Lambic brew day. I chose to do a traditional turbid mash this time. All started with heating up 41 L of water to approximately 45°C in the water kettle. 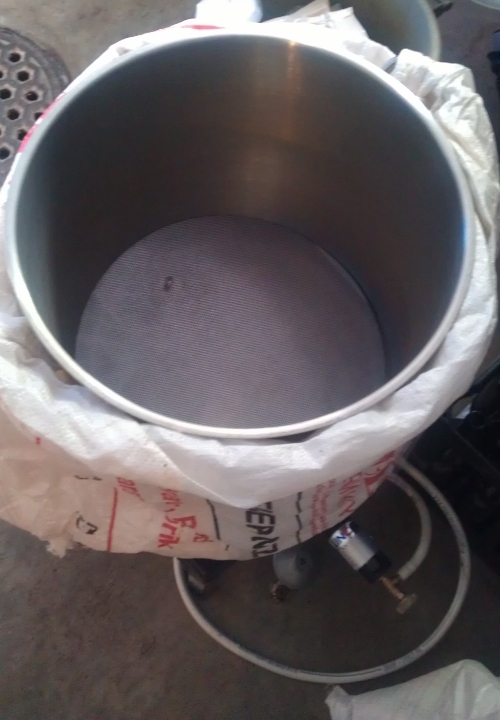 I added my false bottom in the mash kettle to drain off the turbid mash later on (Fig 2). 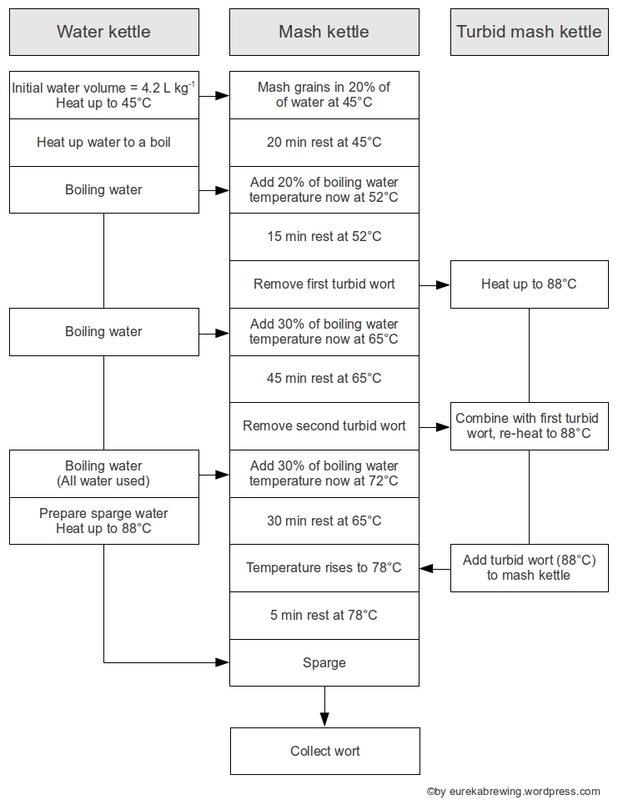 I then transferred 8.2 L of water from the water kettle into the mash kettle and mashed in (Fig 3). The whole mash was very, very thick. I then left the mash rest for 20 min at 45°C. The remaining water in the water kettle was heated up to a boil. After the first rest at 45°C, I added another 8.2 L of boiling water to the mash. The temperature now was 52°C. Another 15 min rest. 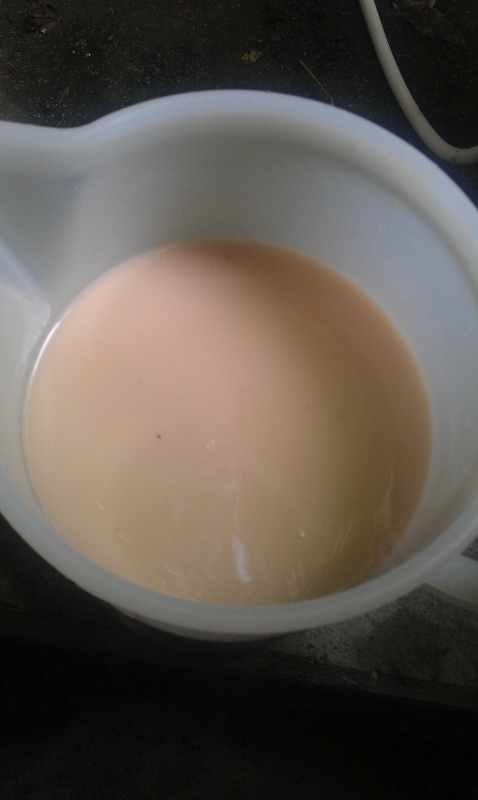 After the second rest, I removed 5.5 L of the liquid from the mash kettle. This wort is called turbid wort. You can easily see why in Fig 4. The turbid wort was heated up to 88°C. After the second rest in the mash kettle (and after removing the turbid wort), I added 12.3 L of boiling water. The temperature now was at 65°C. Rest for 45 min at 65°C. As the third rest passed, I removed another 5.5 L of turbid wort and added it to the preheated turbid wort from the previous removal and reheated to 88°C again. I then added another 12.3 L of boiling wort to the mash kettle. The temperature now was at 72°C. Rest for 30 min at 72°C. Now was the time to heat up the 34 L of sparging water to 88°C. After the rest at 72°C, I added the turbid worts back to the mash and the temperature rose to 78°C. I then left the mash rest for 5 min and sparged to a gravity of 2°P. By the way, the wort was iodine positive. Indicating some starches were still left in the wort. This was the whole turbid mash schedule already. Adding hot or boiling water to the mash to increase the temperature is basically a decoction mash. The special step in turbid mashing are the removal of turbid worts. The turbid worts contain enzymes, sugars and starches. By heating them up to 88°C, the enzymes get denatured (destroyed) and can’t work anymore. This leaves the sugars and starches in this worts. The resting time of approximately 5 min at 78°C after you add these turbid worts back to the mash are not enough to convert the remaining starches and sugars. Meaning, you add some unfermentable sugars and starches back to your wort. These unfermentable sugars are quite important for the Brettanomyces and maybe some bacteria later on during the fermentation. Brewer’s yeast (Saccharomyces cerevisiae) can’t ferment unfermentable sugars and starches. I guess this why they are called unfermentable sugars after all. These unfermentable sugars however can be metabolized by the Brettanomyces and gives these yeasts an opportunity to grow during the fermentation process as these yeasts are rather slow growers. Back to the wort. I boiled the wort for two hours with the addition of 240 g of old hops I stored for at least two years. Can’t remember the variety. I guess it was a German variety like Tettnanger, Hallertauer or Saazer. Then cooled the wort down, added two packages of Wyeast’s Lambic Blend and filled two 10 L, one 20 L and half a 10 L glass carboy with the wort. 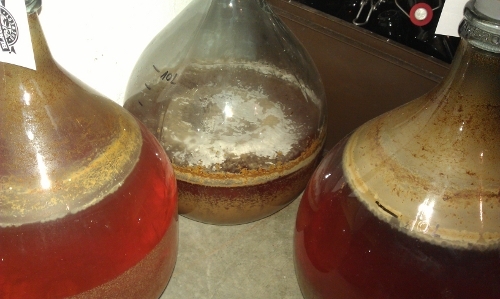 06/29/12: I already had to replace all the airlocks because the fermentation was already in progress (Fig 5). 07/07/12: Lambic already nine days in the carboys. The fermentation calmed down and it was time to add the real souring bugs. I first added medium toasted French oak chips to the carboys (25 g per 10 L). I boiled the chips in some water first (approximately 2 min) and discarded the dark brown water. Then added fresh water again and repeated the boiling process once again. Then discharged the water again and added the chips to the carboys. 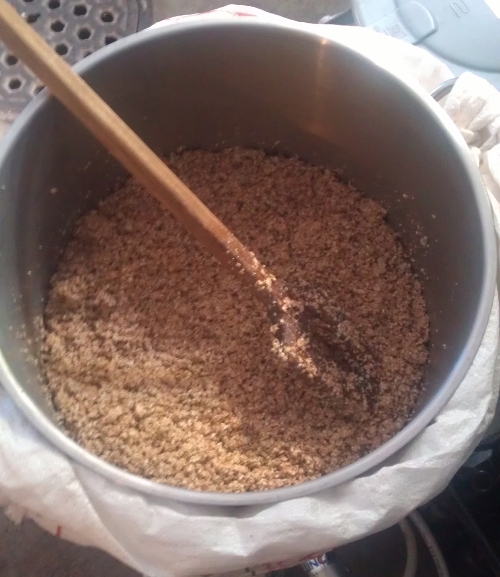 Then added my own souring mixture called Milupa1. This mixture consists of the following bugs: Wyeast’s Brettanomyces bruxellensis, Wyeast’s Brettanomyces lambicus, some Girardin Gueze dregs, some dregs from Les Trois Dames’s Oud Bruin and a Brettanomyces strain I previously isolated from a Cantillon Kriek. This mixture was quite aggressive in some trial fermentations and a pellicle formed just after a few days. Good enough for me to let this mixture eat through some Lambic wort. I added some of the mixture to each of the glass carboys (except one) and left the wort to the new introduced bugs. The one without the Milupa1 bugs is a control to test how the single Lambic Blend from Wyeast works. I hope I could give you some insight into the whole Lambic homebrewing process and maybe give you some new information as well. I will keep updating this post in the future. Stay tuned!